Addition and Subtraction Treasure Hunt! Engaging game for students to play in order to practice their addition and subtraction fact fluency of two and three digit numbers with regrouping. 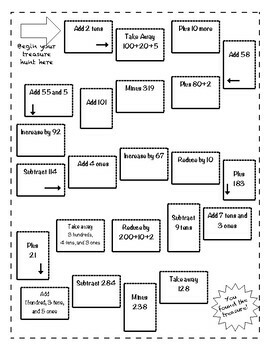 This is a great way to introduce students to multi-step math problems! It combines past skills students have learned, such as place value, key terms, regrouping, fact fluency, and expanded form. 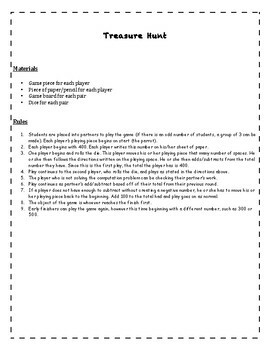 The directions for the game are included in the file. Or simply use the game board in whatever way you would like!